The Alabama- and Colorado-based institute offers online classes for those looking for graduate-level studies in spiritual theology as well as those seeking personal enrichment. 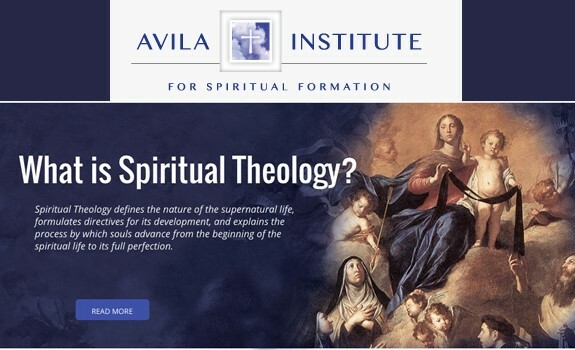 Practically no new educational ventures get off to the kind of skyrocket start the Avila Institute did with its first class in September 2013, an introduction to spiritual theology. Nearly 60 students took the course. Simultaneously, hundreds of potential enrollees—seeking either a graduate-level certificate in spiritual theology or simply wanting personal enrichment—began contacting the Avila Institute. To date Avila Institute has served more than 400 students from 25 countries. The start had a touch of the miraculous about it: the Avila Institute launched less than one month after co-founders Dan Burke and Dr. Anthony Lilles had a conversation about starting an institute specializing in spiritual theololgy. Neither was new to spirituality and theology. Burke is executive director of the National Catholic Register, author of the award-winning book Navigating the Interior Life, and founder of the award-winning website, SpiritualDirection.com. Dr. Lilles is the academic dean of St. John’s Seminary in the Archdiocese of Los Angeles and also an author and speaker on the topic of spiritual theology. The co-founders came up with an online institute fully faithful to the Magisterium to help people advance in the knowledge of their Catholic faith, but more especially in their relationship with Jesus Christ, and in their ability to help others do likewise. In some ways the institute is like no other. It is a two-to-four year master’s-level program in spiritual theology geared toward those seeking a graduate certificate. At the same time it is perfectly suited for others, with or without an undergraduate degree, looking for continuing education or personal enrichment. The course of study serves a global span of people, from priests and religious to laity, from catechists to pre-Cana instructors, from home-schooling parents to Catholic counselors, from professionals to ordinary Catholics looking to deepen their relationship with Christ through the spiritual riches of the Church. Lilles affirmed the Avila Institute’s purpose is to help spur a renewal of contemplative prayer in the Church. No renewal in the Church has happened without it, he pointed out. “Anytime the Church is renewed, there is always a renewal of mental prayer that precedes the other parts of renewal,” he said. The approach drew Sister Dorcee Clarey to join the inaugural class. She is the current superior of the Servants of God’s Love, a religious order in the Diocese of Lansing, Michigan. Once she heard the first online talk by Dr. Lilles, she knew immediately she wanted to study at Avila. Then Burke mentioned it would be possible for her and her sisters to attend without cost. She took him up on his offer; otherwise, it would have been impossible for her to attend. That points to another unique feature of Avila Institute, one that Burke puts at the head of this work’s notable aspects—service to the poor. For people in financial situations like Sister Dorcee, that has been difference between being able to take courses and being prevented from learning more about the faith. Avila funds these scholarships through donations. Nor is the location restrictive. Although Avila is home-based in the Diocese of Birmingham, Alabama, with a recent expansion to Colorado, enrollees can take the online and sometimes offline interactive courses from wherever they live. Avila is Internet-based. Lilles pointed out that because of this opportunity to study spiritual theology at a graduate level in places where students otherwise would not have this chance, the Avila Institute is empowering missionaries and catechists and religious all over the world. Burke also pointed out the impact on individual lives of the laity and religious who study together and interact. “Students regularly report that this is a life-changing experience for them,” he said. Joseph Pronechen is a Catholic journalist and staff writer with EWTN’s National Catholic Register. His articles have appeared in a number of publications including Columbia magazine, Faith and Family, Catholic Digest, and Marian Helper. His religion features have appeared in newspapers such as Fairfield County Catholic and in one of Connecticut’s largest news dailies.